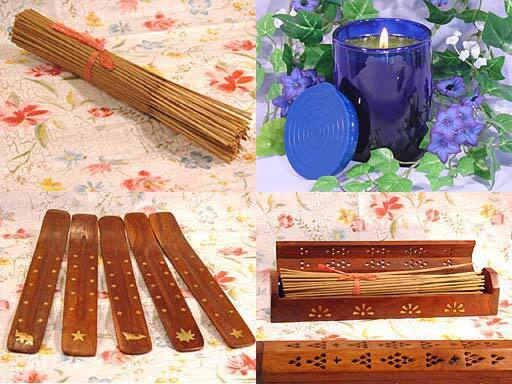 All incense sticks soaked in 100% Natural Essential Oils or Absolutes for up to 6 months, each stick contains 1 gram of fragrance. The only 100% natural incense sticks available, so potent they only need to be kept lit for several minutes at a time ... many hours of enjoyment. All candles made with 100% Natural Soy Wax fragranced with 10 grams of 100% Natural Essential Oils or Absolutes produce a rich, creamy look with a very clean burn lasting 50 hours, capped with a matching lid to keep fragrance in until opened. Scroll down to purchase candles. "AMERICAN INDIAN CEREMONIAL SAGE 11' INCENSE STICK INDIVIDUALLY WRAPPED"
"AMERICAN SPEARMINT 11"" INCENSE STICK INDIVIDUALLY WRAPPED "
"ARGENTINIAN RED MANDARIN 11"" INCENSE STICK INDIVIDUALLY WRAPPED "
"AUSTRALIAN LEMON BALM 11"" INCENSE STICK INDIVIDUALLY WRAPPED "
"CANADIAN FIR BALSAM 11"" INCENSE STICK INDIVIDUALLY WRAPPED "
"COMOROS ISLANDS YLANG YLANG ABSOLUTE 11"" INCENSE STICK INDIVIDUALLY WRAPPED "
"EAST INDIAN SANDALWOOD 11"" INCENSE STICK INDIVIDUALLY WRAPPED "
"ETHIOPIAN SWEET MYRRH 11"" INCENSE STICK INDIVIDUALLY WRAPPED "
"FRENCH LAVENDER ABSOLUTE 11"" INCENSE STICK INDIVIDUALLY WRAPPED "
"INDIAN JASMINE ABSOLUTE 11"" INCENSE STICK INDIVIDUALLY WRAPPED "
"INDONESIAN PATCHOULI ABSOLUTE 11"" INCENSE STICK INDIVIDUALLY WRAPPED"
"JAVAN VETIVER 11"" INCENSE STICK INDIVIDUALLY WRAPPED "
"MADAGASCAR VANILLA BEAN OLEORESIN 11"" INCENSE STICK INDIVIDUALLY WRAPPED "
"MOROCCAN ROSE ABSOLUTE 11"" INCENSE STICK INDIVIDUALLY WRAPPED "
"SOMALIAN FRANKINCENSE ABSOLUTE 11"" INCENSE STICK INDIVIDUALLY WRAPPED "
"TUNESIAN ORANGE BLOSSOM (NEROLI) 11"" INCENSE STICK INDIVIDUALLY WRAPPED "